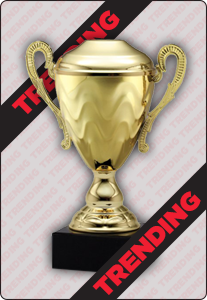 Quickly personalize your trophies below, and we will take care of the rest! We will place the logo and send you a preview for your approval. Up to 40 characters free! $0.10 a character after 40 characters have been reached. Upload an excel file (.xlsx) or Word document (.docx). Disclaimer: Please make sure all spelling and information is correct. Manually enter your own personalization text. MASTER TEXT: Text will apply to all engraving areas. Up to 40 characters for free! $0.10 cents a character after that. This item allows for no character limit (including spaces) per line. Click this box if you don't want to enter your text for each item separately. I have reviewed the engraving information to make sure that all spelling is 100% accurate. Award Size (including base): 7"
This item currently has no reviews. Be the first to review this item! We can add the Little League ® logo to your custom products. Contact us with your product idea and we’ll make your idea become reality. As the Official Awards, Pins and Medals Provider for US Youth Soccer, let us help take your events to the next level with our high quality awards and US Youth Soccer Sponsorship Pricing. Get exclusive updates & special offers! ©2019 Wilson Trophy Co. of California. All Rights Reserved.